We loved Charleston when we visited with our toddler. It’s a walkable city with beautiful homes and plenty of good, casual local restaurants. While kids ages 7 and up will most appreciate the city’s history, most of its unique cultural experiences are doable with kids of any age. Fort Sumter, the Aquarium and the Battery Promenade are the attractions most visitors find on their own. Here are some attractions we discovered via tips from locals that we enjoyed and that we think other families will, too. This community gathering in Marion Square is a must if you’re in town on a Saturday morning between April and November. We sampled southern specialties we’d never had before like giant Muscadine grapes, boiled peanuts and sweet potato pie. We watched a machine make fresh donuts and ordered shrimp and grits from an open-air kitchen. Expect to find live music, artisanal crafts and packaged items like local jam and hot sauce, too. The park also has plenty of space for running around and picnicking. 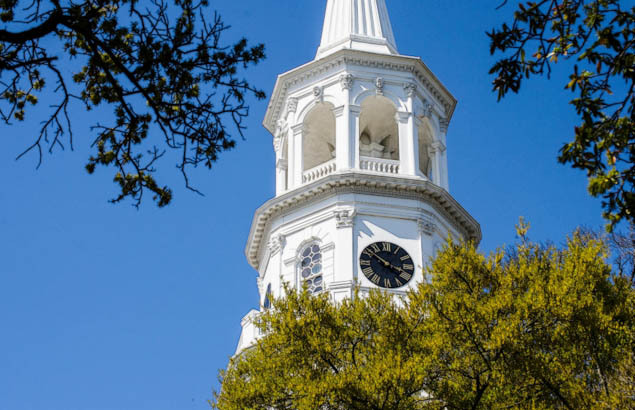 A guided tour is the best way to get an overview of Charleston’s rich past, its role in the Revolution and Civil War and to learn about the people who have owned the beautiful historic homes and mansions around the Battery. Teens can handle a walking tour and they’re well worth it. But if you have younger kids or it’s a hot day, make it easy on yourself and take one of the many carriage tours available. Most run for 35 minutes to an hour and let toddlers ride for fee on laps. The novelty of being on an open-air horse-drawn carriage will engage preschoolers for much of the tour, but bring some snacks and a quiet toy or two, just in case. Patriot’s Point has a Maritime and Naval Museum if you’re into that sort of thing (kids from age 6 into the teens will like the interactive Flight Academy activities). But Mount Pleasant Memorial Park is what drew us there for its very nice playground, green space and a 1,250-foot pier that offers great city and river views, bench swings and a cafe offering sandwiches and ice cream. Nearby Shem Creek is a good place for casual, inexpensive seafood and burger joints. If you need a break from sightseeing, head to the beach. Rustic Sullivan’s Island, funky Folly Beach and upscale Kiawah Island and Isle of Palms are all about a 30-minute drive. They each have a slightly different character but all offer opportunities to swim, walk on the sand, kayak or bike ride and have lunch al fresco. You can be back in the city for dinner. Visiting a plantation is worthwhile for the look it offers into their unique and important role in Southern history. They all offer a plantation house that you’ll find small by today’s standards and can only be seen with a guide, plus sprawling grounds you can explore on your own. We visited Magnolia Plantation because we were told it was the best to see with young children. It has a petting farm, extensive gardens, a boat ride of flooded rice fields and a stroller friendly platform walk through a swamp. Boone Plantation is popular for its spectacular Avenue of Oaks. It also offers tours and reenactments that explore slave history and Gullah culture and a kid-pleasing butterfly garden. McLeod Plantation on James Island has only been open to the public for a few years. Tours and presentations explore the history of cotton farming and the stories of the white and black (slave and free) residents of the plantation and the island itself. We liked the Ansonborough Inn, a converted colonial warehouse on the edge of the historic district, for its loft-style rooms that offer parents some privacy and have refrigerators and microwaves. Complimentary breakfast and afternoon wine, cheese and cookies made the whole family happy. The Mills House Wyndham Grand offers upscale Southern comfort in the heart of the historic district and a rooftop pool. The DoubleTree Historic District offers larger than average rooms in town. There are ample budget and family hotels with pools across the river.